The Lower Modernisms – 050. Lomo Featured Project: Taco House. Lomo Styles: Vernacular Pompidou. October 7, 2012 by James Black. Although its subject was both populist and endangered, our recent post on the topic of Noyes-pattern Mobil service stations veered into corporate High-Modernist territory through a blurry border-crossing where High and Low meet. Today’s featured project, Taco House at 215 West 8th Street, better reflects the standards of humility to which the Lower Modernisms project is dedicated. 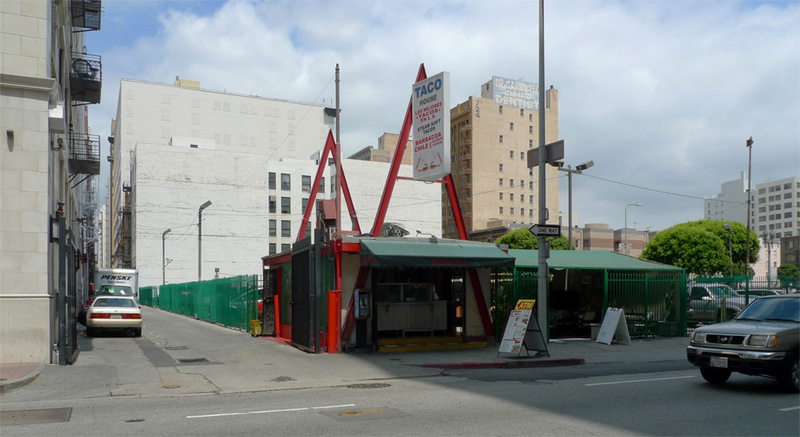 Humble in programme, size, and finish, the semi-enclosed, unconditioned volumes of the Taco House barely even qualify as a Building, much less as Architecture. Built in the shady corner of a downtown parking lot, Taco House would look temporary if it did not look so old, a somewhat improvisational exploitation of an underused piece of downtown property waiting for a higher and better use to come along and bring about its redevelopment. The County Assessor’s office certainly views Taco House this way: the 15,500 square-foot parcel has an assessed land value of $1,185,000, with assessed improvements, comprising 330 square feet, valued at only $750. Taco House offers easy-going hospitality in the kind of hybrid indoor-outdoor space espoused by the Mid-Century Modern designers. It is oriented to pedestrians with a sidewalk canopy and a porous street wall. Taco House embodies certain urban, informal virtues; but it is the steel-framed structure that attracted Russ Holthouse and I to make our recent lunchtime visit. The freely extended frames resemble hanging brackets, as if Taco House were a module designed to be lifted by crane or helicopter and plunked down in whatever parking lot requires a Taco House. The steeply-pitched steel frames evoke the proportions of an A-frame house, but skeletal, incomplete. Technically, these frames seem to be “bents” such as those that hold up a Butler building, as they appear to carry both the gravity loads of the roof and provide the in-plane resistance of lateral loads. The bents are painted bright red, which is eye-catching, but probably not intentionally in homage to Renzo Piano’s use of red paint on exposed steel members. 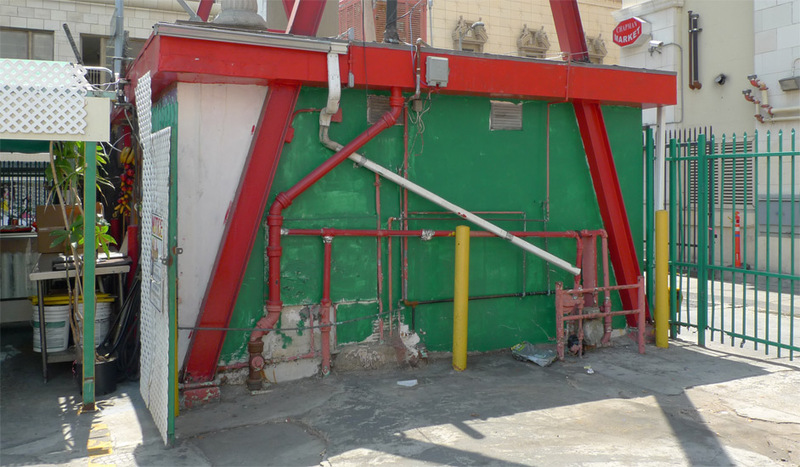 On closer look, however, perhaps Piano was an influence on Taco House’s designers, as the rear facade is detailed as an exoskeleton with service elements, including structural, piping, HVAC and bollards, exposed and painted in a collection of contrasting colors – an example of the “Vernacular Pompidou” style named in honor of Piano’s and Richard Rogers’s Centre Georges Pompidou in Paris. 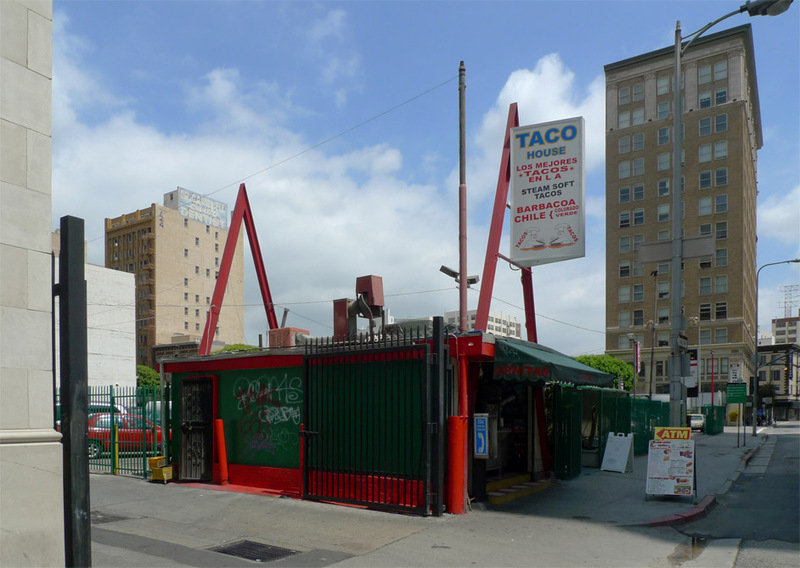 The use of those ostentatious steel bents in a taco stand otherwise so unassuming leads one to wonder at an explanation – it seems improbable that they were designed and built custom for this application. Perhaps the steel members were an off-the-shelf item, or perhaps salvaged and reused from some other structure. 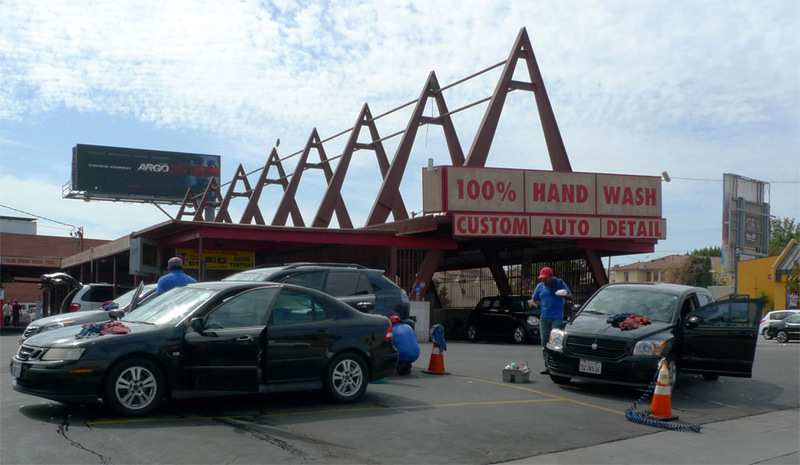 Was a car wash, such as Expert Car Wash at 900 South La Brea Avenue depicted above, disassembled and adaptive-reused as taco stands? The fact that there is a second, nearly identical Taco House at 340 South Hill Street, neither confirms nor denies this possibility. The tacos, generously sized at $1.25 each, were decent and satisfying. 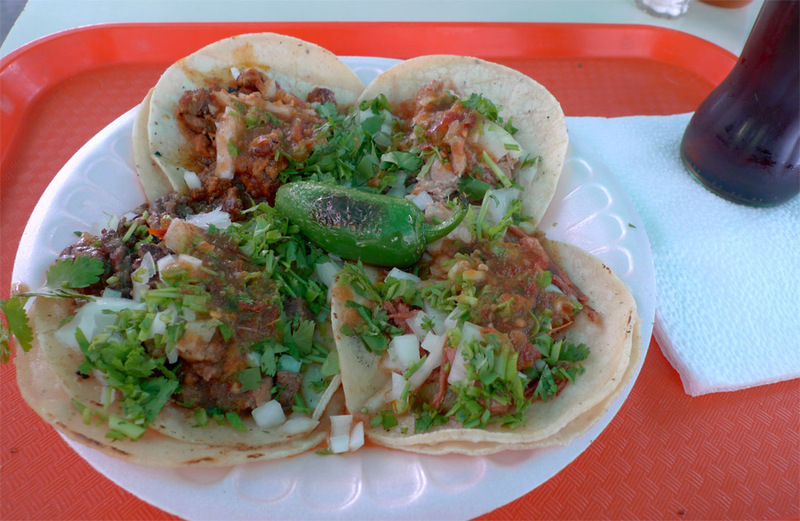 The softly rounded tacos seem a perfect remedy to counter the sharp angles overhead. 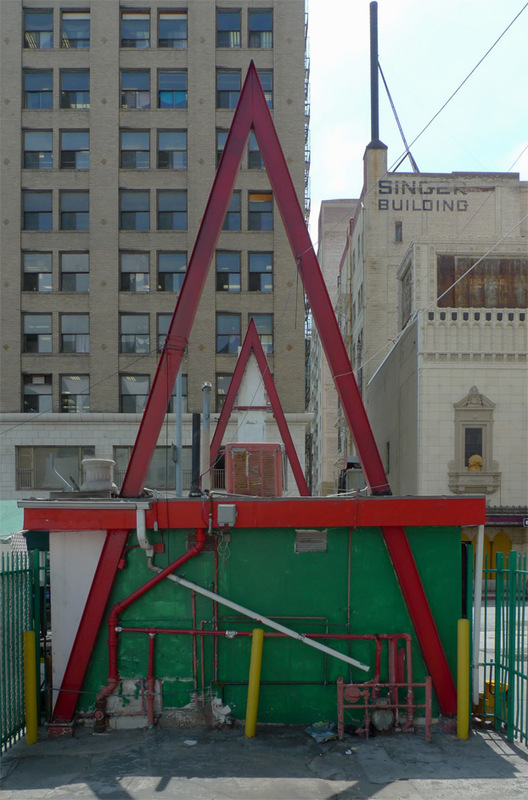 That is true – this skeletal A-frame fails to uphold the analogy between the crunchy taco shell and the conventional A-frame structure.